Happy weekend... I hope you will not be bored because today I would like to share an AIMP4 skin again. 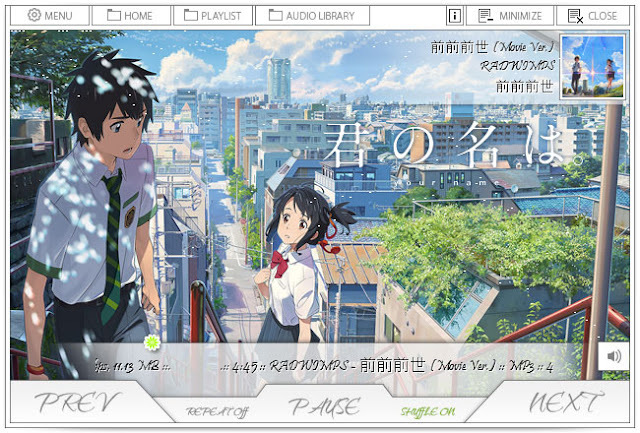 I promise, I will make an anime theme again soon, but for now let’s focus on AIMP4 skin first. This skin is my second skin with AIO (All in One) Concept. 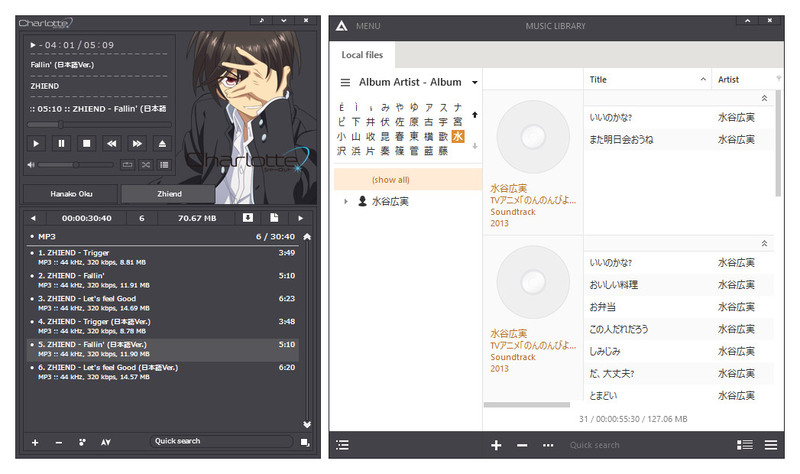 Previously I had made skin AIO, if not wrong at that time the character was Nico-Love Live for AIMP3. And now, I choose anime movie that just aired a few days ago in Japan, that is Kimi no Na Wa. This anime movie is the latest work from Makoto Shinkai. I made this skin from Blank Project. Step by step, I designed and made the buttons for this skin, it is very tiring but I am happy. Fortunately, I didn’t get a lot of constraints. I just mess around on the font selection. I feel this skin will match with handwriting font style, but in fact not that easy. I have to choose the right font to make this skin look good. Hello friends, how are you? It’s been a month since my last update. Well… it’s normal right haha. Ok, today I want to share a new aimp4 skin. 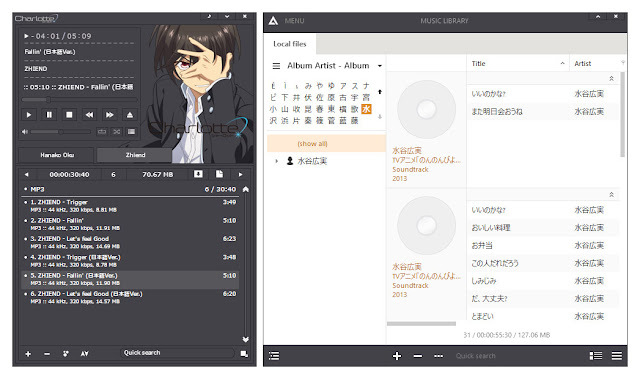 Wow… the last time I share an aimp4 skin on January, it very long. This few days, I tried to redesign my old aimp4 skin. 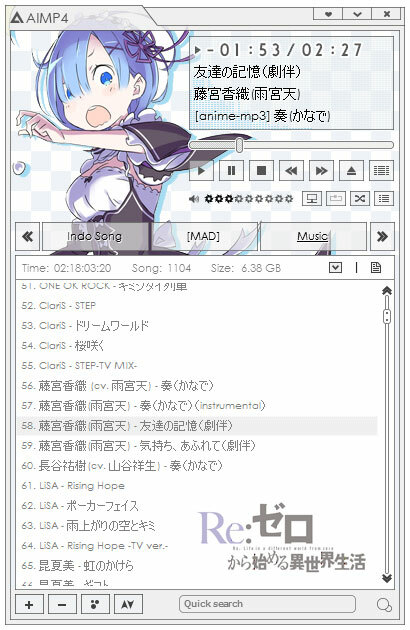 That is aimp4 skin Yuu-charlotte. Fortunately, I was having a good mood. So this new skin can be completed. The character that I choose now is Rem from Re:Zero kara Hajimeru Isekai Seikatsu anime series. Why Rem? I have no special reason; I just want to make it. So guys, here the design of this aimp4 skin. This skin does look the same as Yuu Otosaka skin or Megumi Kato skin. But, actually different. Because the Playlist and the MainForm fused. But calm, this skin still support dock to left or dock to right screen. 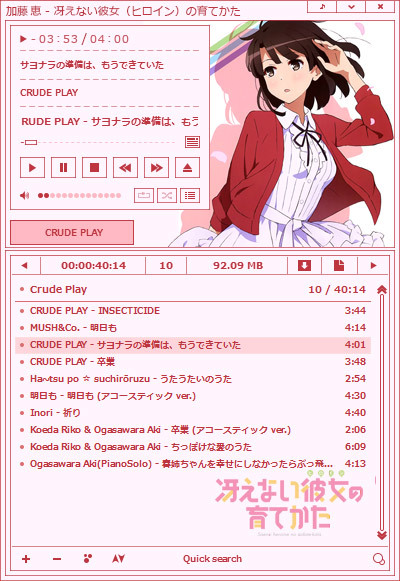 [New update: AIMP4 skin released] now was come from one of the main female character from Saenai Heroine no Sodatekata series. About design of this skin, I call it ‘Simple Box’, same like aimp4 skin charlotte. This skin was requested by Thái Quý. The reason why I make this skin in addition to the request is because I really like megumi kato. If I remember that I also not yet make this anime for windows theme. Maybe, I’ll try to making it. Do you like it? If you are Megumi Kato fans, I recommend this skin for you guys. Let’s see how the display of music library from this skin. Good night guys, today I wanna share new aimp skin again. It’s for aimp v4.00. This time the character I choose is Koito Minase. 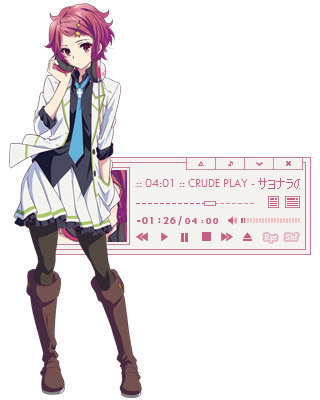 She is one of the main female characters of the musaigen no phantom world series. Actually, design of this skin is not new, I’ve made skin with design like this before. But, this time created to purpose with aimp v4.00/aimp4. This skin created with a few extra buttons and new design for display of seekbar and volume. Let’s see the display of music library for this skin. *Read this : What's new in AIMP v4.00 in comparison with v3.60? At first I made a skin for aimp4, I got some trouble. Especially on the part of the music library. But now I'm quite able to control it.